Since it rain non-stopped this past Sunday, we were stuck at home and I had plenty of time on my hands. The only way I was going to curve the “cabin fever” was to keep busy and so I decided to make three recipes in this week Gutsy Cooks recipe line up. This one is the first. I will post the other two tomorrow and Tuesday. When I took a look at our choices, I originally wanted to make the savory Italian Arancini, which holds a special place in my heart since they remind me of my time living in Sicily while working as an Au pair. But, then I thought, why not try something completely new, something that I really never tasted before? 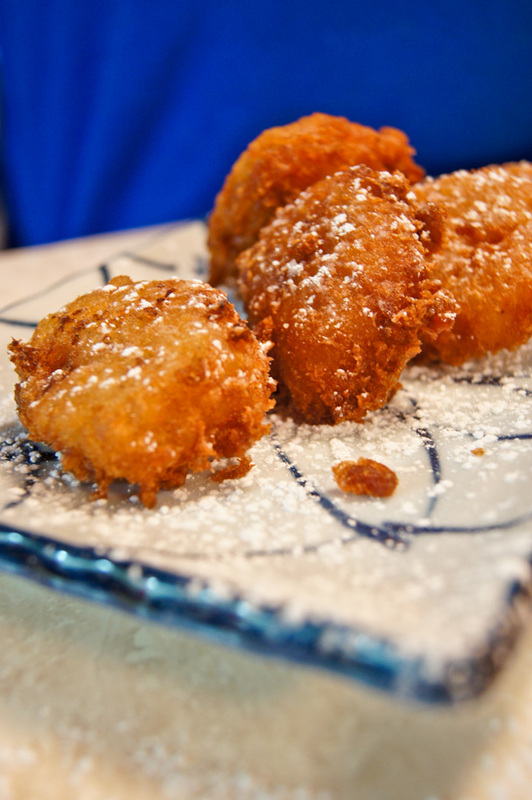 And that is when I turned to the other choice in our list – Calas, which are sweet Fried Rice Fritters from the French Quarter in New Orleans. I just could not go wrong with this. 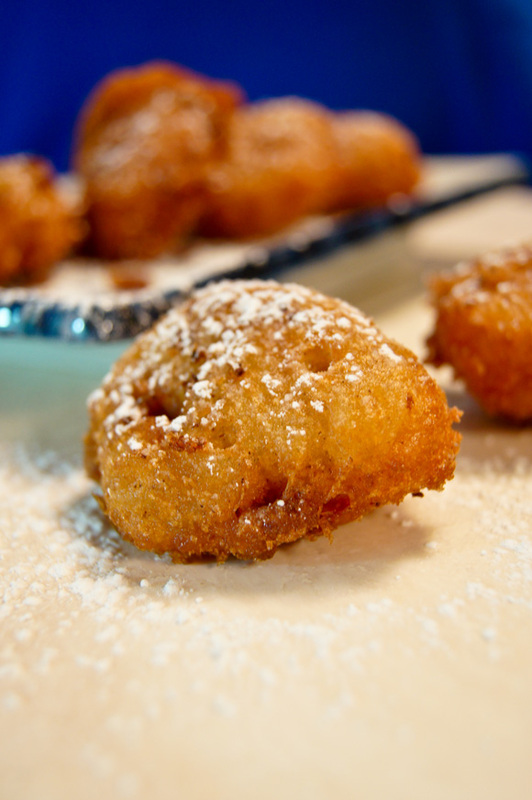 Fried batter - is there anything better in life? (besides Nutella, or course). Also during my research I found different takes in the recipes – the usual old school called for cooking the rice until it’s mushy and then letting it rise with yeast overnight. While that sounded even better than using the baking powder, I knew it was not going to work, since I had no time to do this overnight. So I stuck with the “inspiration” recipe that I had originally found in the Saveur web site. Of course I put my own spin on it. All of the recipes I read used left over rice, but I just could not imagine this recipe working with any of the savory left over rice in my refrigerator at the moment - Chinese fried rice and cinnamon just did not seem like a good flavor combo. So I decided to make my own rice. I wanted the rice to tasted like something on the sweet side and so I use coconut milk instead of water and added a bit of sugar and salt. I also reduced the amount of ground cinnamon to half a teaspoon and the other half was replaced with some nutmeg. The other thing I did differently was let the rice cool down quite a bit by placing it in the refrigerated once it came down to room temperature. I think this helped quite a bit with the final texture, since it keep the grains separated and not clump together in the fritter batter. Bring the coconut milk with a pitch of salt to a boil in a small saucepan. Add the rice, stir once, reduce the heat to low, and cover the pan, cooking 18 to 20 minutes or until the grains of rice are plump and fluff apart with a fork. Turn the rice out onto a parchment paper––lined baking sheet and cool for 15 minutes, then cover with plastic wrap and poke a few holes in the top. Refrigerate for at least 4 to 8 hours or up to 2 days. Whisk together flour, baking powder, cinnamon and nutmeg in a medium bowl; and set aside. Using a stand mixer or a hand mixer, beat the eggs, sugar, and vanilla on high speed until foamy and tripled in volume, 2 to 3 minutes. Add the dry ingredients, and stir with a wooden spoon until just combined. Add the rice and mix until the fritter batter just comes together into a loose, roughly textured ball. Cover the bowl with plastic wrap and let the batter sit for 30 minutes in the refrigerator. Pour enough peanut oil into a large pot to fill it to a 2 to 3-inch depth and bring to a temperature between 350°F and 360°F over medium heat. Line a plate with paper towels and set aside. Once your oil is hot, dip a teaspoon (or a cookie dough scoop) in the hot oil, then into the batter and scoop out a heaping teaspoonful. Hold the spoon close to the oil and let the batter roll off and into the oil. 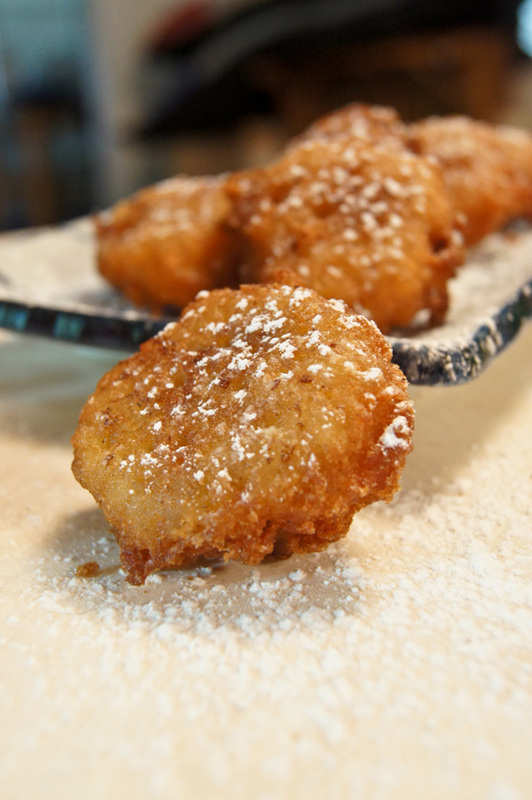 The fritter will sink to the bottom of the hot oil, rise to the surface and then (usually) flip over when one side is done. Fry to a golden brown and remove to paper towel with a slotted spoon. Sprinkle with icing sugar, and, if you want, also add cane syrup, honey or molasses then serve hot and watch your people fight over them. And like every week, check out what other Gutsy Cooks have created in their Kitchen with this weeks inspiration recipes.